Well, you can definitely see the falls! Even with regular access to satellite imagery from sites like Google Maps, I find there is always something special about seeing where you live from many miles (kilometres) above. Lake Ontario has a very distinctive look...that's all I'll say. Hey! There's my house! Just north of the quarry. Looks like Mississauga has a bigger footprint than T.O. 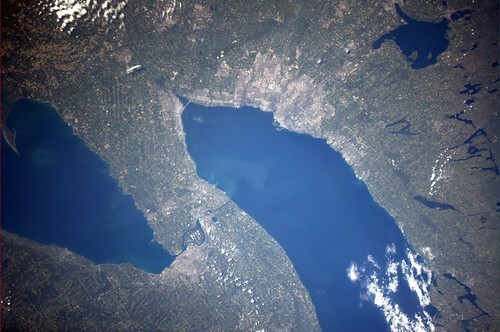 I've never noticed this until now; Lake Simcoe looks like it's pointing a finger-gun at us!